We’ve added a bunch of pics of the DC Collectibles booth. These photos come in from this morning’s walk through of the show. Some things we’ve seen, but just better shots. 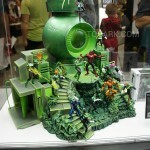 There’s a bunch of nice close up shots of the Green Lantern display. In addition to Astrocitus there’s a number of other 3-3/4″ Lanterns shown who may or may not be upcoming releases for 2013(EDIT: Hal Jordan is shown too and we figure that’s an inevitable figure for release). Also shown are the New 52 JLA figure set and the big Darkseid figure. EDIT: Toyark reps spoke with the DC Collectibles rep today. They said the feedback has been great on the 3 3/4ths figures, way more so than they expected, and that they will be heading back and trying to figure out how to get going. Nothing 100% official or confirmed, but bottom line, they are going to be looking hard at making this a broader line. Make sure to continue sounding off about what you like and don’t like, desired price points, etc. Can be helpful in these earlier stages.